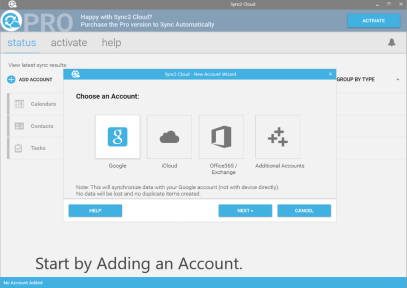 With Sync2 Cloud it is very easy to sync Outlook Calendar, Contacts and Tasks with Android phone. 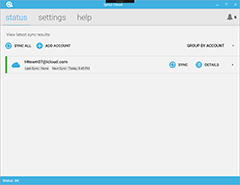 After synchronization you will be able to see and edit your Outlook Contacts, Calendars and Tasks on your Android phone. Synchronize Outlook Calendar, Contacts and Tasks with Android phones. You can manage your Outlook Calendar, Contacts and Tasks on Android phones. Manage your Outlook Calendar, Contacts and Tasks on Android phones. Using Sync2 Cloud you can sync Outlook Contacts, Calendar and Tasks with Android without connecting your phone directly to your computer. Access Outlook contacts on your Android phone. Note: you will need to connect to your Google account on your Android device to begin synchronization. To learn more about how to set up your Android phone with Google account click here. In a few moments Microsoft Outlook will be synchronized with Android phone.